This weekend (21-22 September) sees Irish figure skaters Sam McAllister (19) and Conor Stakelum (25) take to the ice at the Autumn Classic International in Oakville, Canada for their first international competition of the 2018/2019 season. Both athletes are coming off the back of the greatest successes of their skating careers yet. 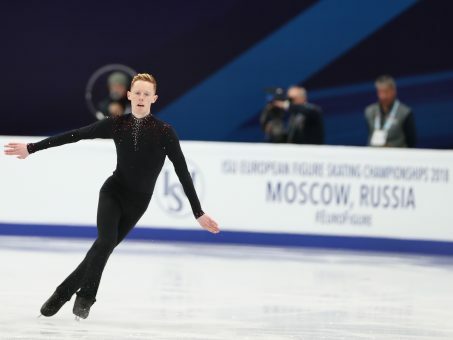 In January, Stakelum became the first Irish male skate to participate in the European Figure Skating Championships which were held in Moscow, Russia. In March, McAllister represented Ireland at the World Junior Figure Skating Championships in Sofia, Bulgaria. He was the first Irish skater to do so since 2010. As McAllister has aged out of the junior ranks, this will be the first time that two Irish figure skaters are entered into the senior category at the same international competition. They will also compete alongside a high calibre field that includes two-time Olympic gold medallist Yuzuru Hanyu from Japan and 2015 U.S. champion Jason Brown. “I am excited to have made the move up to seniors this season and to be skating at an event with so many amazing skaters,” McAllister said. “I am looking forward to building on my accomplishments from last season and bringing my skating up another level,” Stakelum said. The two Irish skaters begin the competition with the short programme begins at 6:13pm on Friday 21 September and finish with the free skating at 5:28pm on Saturday 22 September (all Irish time and subject to change). You can follow their progress live and with full detailed results here or through the #ACI18 hashtag on social media.